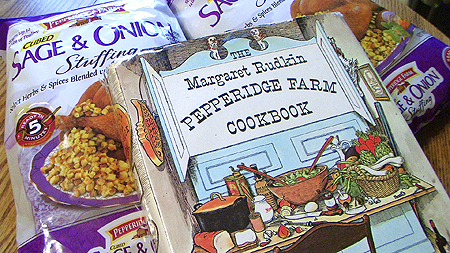 When I picked up Margaret Rudkin’s autobiographical “Pepperidge Farm Cookbook” from 1963 at an antique shop back in March, it was with hopes of finding some of the company’s original recipes. Mrs. Rudkin, it turns out, did not disappoint. My maternal grandmother used to make a seriously-good sage & onion stuffing. Grandma Liske probably did as well, although I was born a few years too late to find out. It seems to be a perennial favorite, with numerous variations appearing on my plate from various cooks throughout my lifetime. Turkey time at Thanksgiving was a great treat — not because of the turkey, to my mind, but for the stuffing. I was so crazy about the stuffing that after the turkey was stuffed to bursting, an extra portion was wrapped loosely in a square of cheescloth and tucked into the pan alongside the turkey. The rich turkey fat sizzled round my little bundle, and when the cheesecloth was opened up, there was a crisp golden ball with a soft, spicy, fragrant center, all for me. There it is … me wanting one of those same balls of freshly-roasted stuffing. But dagnabbit … now I’m sick. Flu-bug, or some such nasty thing. Hense the bags you see here of the commercial goods, which according to Mrs. Rudkin should still have been derived from her grandmother’s method. Maybe I’ll make the original for Christmas dinner. That is, if I don’t have pneumonia or something. My grandmother didn’t use any measuring spoon for the spices — she gauged the amounts by tasting and sniffing. When the big day came, the kitchen table was cleaned, a bowl of cool water was placed on one side, a large empty bowl was placed on the other side, and in the middle were thick slices of dry bread with the crusts removed. Each slice was dipped into the water and then squeezed out thoroughly. Why it had to be dried out for days and then wet again was a mystery, but whoever figured it out was mighty smart because the moisture was just right. It’s a grandmother, Margaret. No explanation will ever be given. It’ll just drive ya’ knuts. The moist slices were crumbed by rubbing between the hands, and then salt, pepper, sage, thyme and finely chopped white onions were added and tossed well together. Melted butter was poured on and everything tossed together lightly with a fork. This then begs the question; Why, when this process, and the recipe at the bottom of the same page (shown above) both use crumbs, do today’s pre-packaged stuffing mixes, including Pepperidge Farms brand, use cubes of dried bread? In a bakery you never know exactly how many loaves to bake, so you are almost sure to have some left over after the orders are filled. I remembered how much I loved stuffing, so I decided to make some from the extra bread. But fresh bread crumbs have a certain amount of moisture and will not keep long without molding. A dried product which could be packaged seemed to be the answer, but there were problems galore. We had to find a way of drying the product and still keep the aroma and flavor of the herbs. We finally solved it by making a special machine for our Pepperidge Farm Stuffing. The packaged stuff … ing is like the original, her grandmother’s recipe. Only different. Chop the onion very fine. Mix with the bread crumbs. Add the powdered sage, salt and pepper, and mix well. Add the melted butter and toss with a fork. Mix together all the [first eight] ingredients in order as listed. Turn into a greased loaf pan, 9 by 5 by 3 inches. Bake at 375 degrees F for 30 to 40 minutes until firm. For the sauce: Blend the cream of celery soup with the milk in a saucepan. Simmer for about 2 minutes. @Karen, if you can find a copy of her book (JT did) it’s worth anything people want to charge for it. Thank you for a great history read and a great recipe! On my way to some great stuffing for an after Christmas turkey! This is great! Hope you’re still around! Thanks Deb, I’m still here, it’s just been a really busy year. Hi. I came across your post while doing some research for a family cookbook I’m attempting to pull together. Thank you for sharing your story. 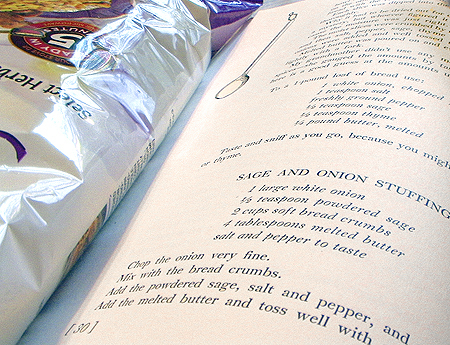 It reminded me so much of my grandmother and her cooking that I went out and bought a copy of the Pepperidge Farm Cookbook!…and you’re right! It’s amazing. Margaret Rudkin is a fantastic storyteller and the book really is a gem. It’s like stepping back in time. I’m surprised more people don’t know about it / her. I can’t wait to really dive into it. I just wanted to say – thank you! I have the book and it is very cherished. I had the pleasure of visiting the farm (after it was operational) but it sill was a walk into history . I love the book and if anyone notices the artwork as a side note are quite hysterical! !